The goal of this course is to provide the participants with elementary skills and knowledge to start working on their own database. The course will be mostly practical, with candidates working with laptops on different organized tasks and homework assignments. Creating an efficient, well-defined set of data is the first step toward any significant computational exploration; whether the researcher is interested in an interactive map, a network visualization, or statistical analysis. Being able to present and share the database and/or the resulting visualizations online allows young historians to support their research conclusions with the data they are based on and serves as proof of their computational skills for future applications. The course is organized for a group of 15 young historians ideally in their PhD or final phase of their Research Master. No previous knowledge on databases or programming is required. In advance of the course, applicants will be asked to write preliminary ideas for a database and to prepare a (small) set of data. Participants will obtain 2 ECTS upon completion. The course starts with two meetings in which the participants will acquire the necessary conceptual understanding of data structures and get accustomed to the means to set up their own (small) dataset. During the third meeting several historians will present their own database projects, and the practical application of this type of digital research. This is followed by a session focusing on ways to visualize and interpret their own datasets (networks, graphs, maps, timelines). 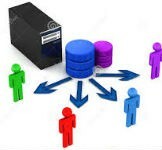 Attention will also be given on how to share the databases online with the broader academic community. After a couple of weeks, the participants will present and reflect on their own work during a fourth meeting. Feedback will be provided by Pim van Bree, Geert Kessels and Charles van den Heuvel. 25 & 26 January: Theory and practice, database structures and design of own dataset. 27 January: Visualization and interpretation. (Edam project), Speaker t.b.a. SPIN, Kathleen Lotze (Cinema projects, CREATE). Send your name, affiliation, current educational program and motivation to take part in the course (250-300 words) to dbsyounghistorians@gmail.com (Leonor Álvarez Francés).